This story was originally published on Stephanie's personal blog on April 30, 2016. It’s funny how a reunion can make people nostalgic for their younger days. It’s a time to reflect and think back about how we grew up and memories we made. I feel blessed to have spent my childhood in Jackson, Tennessee. It’s the foundation to who I am as a person, and I can’t imagine growing up in any other place. With that in mind, I thought I’d share some memories I have with you. I’m thinking if you lived in Jackson in the 80’s or 90’s, you might relate to many of these. Do you remember . . . I loved riding the helicopter as a kid, playing Galaga that was built into the table, and eating their salad bar on those tiny wooden plates. Lollipop was our waitress, and Lefty was our cook. Lefty was always yelling at somebody! I loved their meat-and-three menu and the desserts at the end. The cost of admission was three Coke bottle caps. The movies were during the day, and it was for kids only. I remember carrying my three bottle caps in a Ziploc bag and praying I’d win a twelve-pack of Sprite (one of the door prizes). Me and my sister in matching overalls eating with my parents. Check out that floral covered high chair! The only movie I remember seeing there was The Adventures of Milo and Otis. I looked it up online, and it aired in 1986. Speaking of movies, does anyone remember Flicker’s? It was a true bricks-and-mortar movie rental store before Blockbuster came to town. The two choices were Beta and VHS. I also remember Varsity Video on Oil Well Road. Before Ticketmaster.com, we had to actually go stand in line for concert tickets. I remember standing in line with friends (the floor was brick) and waiting for hours for New Kids on the Block tickets. Can you imagine standing in line anymore for concert tickets? Enjoying my birthday at McDonald’s. It’s too bad they spelled my name "Stephan." How much fun was it to shop by choosing an item, grabbing a ticket, then going and waiting for the items to come down that silver conveyor belt?! Growing up, the cool places to have birthday parties were McDonald’s (with that cool rectangular cake), Magic Wheels, Casey Jones Village ice cream parlor, or quite simply your house where your family came over to have cake and ice cream and open gifts. Remember how simple birthday parties used to be? 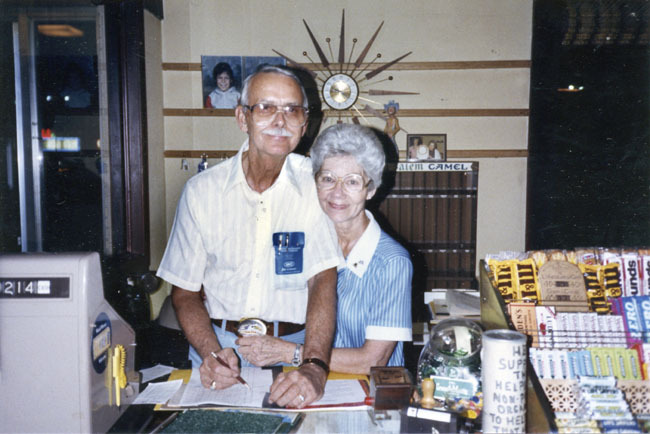 Mr. & Mrs. Skeeter (image courtesy of Jackson Sun archives). 10. The restaurants that aren't there anymore. My family loved these places: Skeeter's (Mrs. Skeeter’s cucumber dressing was delish), O.D. 's (Mr. Gomez’s restaurant with great lemon icebox pie and barbecue), Suede's (where I worked several summers), Old English Inn (all I remember is that it was super dark in there and they had great little mints when you left), Rax's, Chase's, and—probably my favorite—Hero’s. I thought it was so cool that the waiters and waitresses dressed in costume. There was a shoe store next to Kisber’s called Sailor’s Shoes, and that’s where we bought saddle oxfords to go with our uniforms. I also remember Tempo in Hamilton Hills where my mom bought me stone-washed Guess jeans that I was dying to have. How about Klassy Kids on North Parkway and Goldsmith’s (before it became Macy’s)? Belk had a little place in the back where kids could go in without their parents and buy them gifts. I think the thing at Highland Park was called Santa’s workshop. I’d love to know what I bought my parents those Christmases! Let’s talk about Highland Park for a minute. If you lived in Jackson in the 80’s and 90’s, you probably remember that area being called Hicksville. Highland Park Grocery had the best bakery (my Poppy and dad loved their coconut balls), and a Dairy Queen was right next door. I don’t remember The Hut like my parents do, but I’ve seen pictures of how cool that place was in the 70’s. I loved playing at Highland Park. I remember burning my backside on that big, tall, silver slide that heated up like crazy in the summer. I’ve heard many people mention breaking arms and legs on the merry-go-round—that flat, spinning disk that people were catapulted off at times! I have pictures of dance recitals on the stage at Highland Park, too. I know many a family has celebrated their family reunion underneath the covered pavilions there as well. 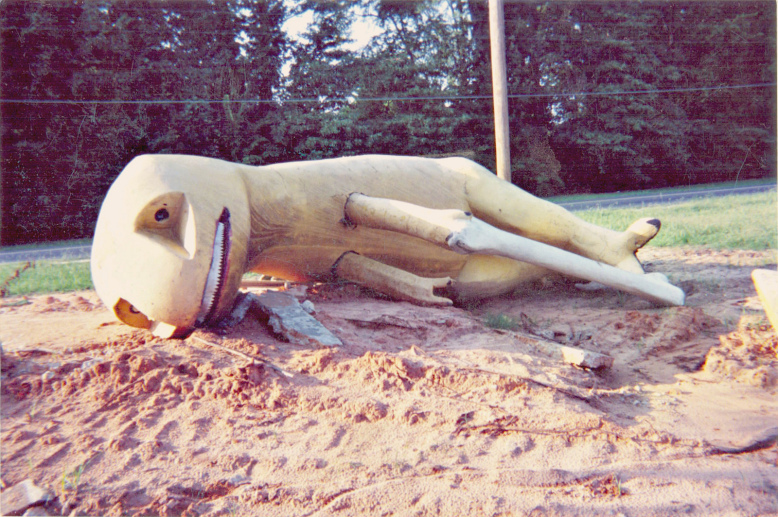 The dinosaur with the blinking eyes (image courtesy of Flickr). Did you and your family go to Sun & Swim? If you did, I’m sure you remember the three different sized pools and the high dive. I remember coming back to Jackson after having been gone for a few years and finding that the pools were completely gone. My family and I spent every summer day up there. I remember being old enough (so probably like eight years old) and getting to walk next door to the Bull Market to get candy cigarettes. If they were out of the hard candy cigarettes, we would just get the bubble gum cigarettes. You could blow into the wrapper, and some type of powder would come out to make it look like real smoke. Can you even fathom that happening today? If you weren’t a member of Sun & Swim, I bet you played Goony Golf or rode the Zoom Flume. If you played putt-putt, do you remember the spider with the long legs that would always try to get your ball? What about the enormous dinosaur there? You might have played baseball at Lions Field next door or gone bowling at the bowling alley there. I was a “Trendsetter” at the Old Hickory Mall. I remember vividly having to “model” cheese balls from Swiss Colony. Why did I think the headband with pushed up bangs was a good look? Check out Names ‘N Things in the background. Did you ever play the Chicken and Egg game at Gibson’s in Hamilton Hills or ride the animals in front of K-Mart? I know we begged to do it all the time growing up! Let’s go back to Old Hickory Mall—did you eat at The Orange Bowl or “I Can’t Believe It’s Yogurt”? Did you buy a “Cassingle” from Camelot so you could always play your favorite song whenever you wanted? Did your mom shop at Mom and Tots? Did you love the window displays at Casual Corners? Did you ever shop at the Walgreens and remember eating at the restaurant there? If you were a girl in the 80’s in Jackson, you probably bought a splatter-painted lunch box and Lisa Frank scratch-and-sniff stickers at Names ‘N Things. Did you feed the ducks at Campbell Lake or Muse Park using stale bread your mom had left over or go fishing at Lake Graham? Do you remember when we were area code 901? Do you feel lucky to have grown up and spent your childhood in our little hometown of Jackson, Tennessee?! I sure do. Stephanie Alexander is a West Tennessee native, married to her high school sweetheart, and mom to two beautiful children. She is the co-owner of The Venue at White Oak Farms with her husband Josh. She loves party planning, DIY renovations, antique and estate sale shopping, cooking-especially baking, being creative, interior decorating, and farm living.